We are pleased to inform all candidates who duly registered for the 2019 Joint Admission And Matriculation Board (JAMB) Unified Tertiary Matriculation Examination (UTME) that printing of the examination slip will start as from Thursday, April 4, 2019. The JAMB slip is an official document containing a candidate’s personal information, such as examination center/venue, date, time & examination seat. The JAMB’s Head of Media and Publicity, Fabian Benjamin who made this know to us asserted that candidates are expected to print their slips before Thursday, April 11, 2019, in order to acquaint themselves with the examination schedules as no form of excuse for missing the examination will be Considered. The Jamb UTME 2019 Examination is expected to start from Thursday, 11th April 2019. All the applicants who applied for the exercise are advised to prepare adequately for the examination. 1. 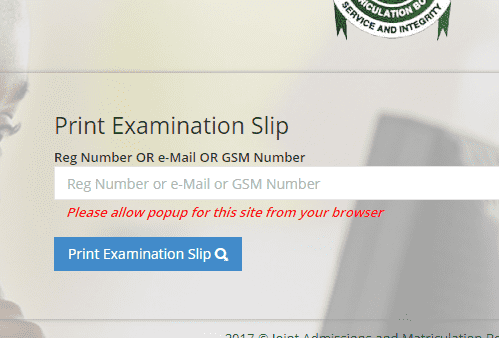 Visit JAMB UTME e-slip printing page at https://www.jamb.org.ng/ExamSlipPrinting/_PrintExaminationSlip. 2. Enter your JAMB Registration Number or Email address or Phone number in the appropriate column. 3. Lastly, Click on the title ‘Print Examination Slip‘ to access your exam schedule.